When people who don’t live with IBD offer their “advice,” how can you cope with it? It’s true that some people aren’t giving advice out of the goodness of their hearts, but this is going to be the minority of folks. Most people are offering their take on the situation because they are truly interested in helping. They may not have an appreciation for how complex IBD is and how many different things most patients try that fall outside of conventional medications in order to get the disease under control. It can help to remember that the advice probably isn’t meant to cause upset or to be patient blaming: it is meant to be useful. Taking a breath to consider that can be helpful when the advice gets to be too much to handle. Most people who live with IBD become experts in the disease — and in their individual type of IBD — fairly quickly. 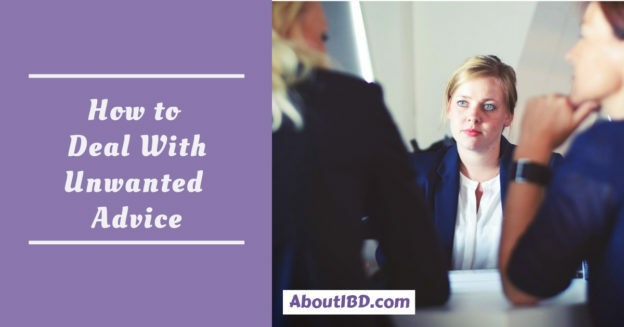 Outside of an IBD specialist, there’s not likely to be much that a person who doesn’t live with the disease can offer in terms of solid advice. However, that doesn’t mean that every single piece of advice is bad or deserves to be disregarded. The signs and symptoms of IBD are insidious and sometimes the people around us can see something about ourselves clearer than we can. It’s possible, then, that an advice-giver can offer a grain of truth that’s worth considering. Perhaps there is something that could help ease a symptom or be effective for reducing stress. Is it worth considering a piece of unsolicited advice every so often? Maybe! Take into consideration the source, especially when it’s someone close to you who has your best interest at heart. In some cases it might be clear that the advice is well-meaning but still off-base. The advice-giver may not want to give up, however, which can be a challenging situation. This may present an opportunity to educate about IBD but in some situations it may not be appropriate or the advice-giver may not be receptive. This may all translate to having to listen patiently to advice that will certainly never be acted upon. In order to prevent further discussion, the best idea may be to acknowledge, thank, and gently but firmly discourage further conversation. Changing the topic of conversation is an art and can prove tricky at times but a tactic that often works is to turn the focus onto the advice-giver. Ask them about their health, their family, or something else that is important to them and keep building on it until the opportunity to leave the discussion presents itself. Being overwhelmed by an advice-giver or subjected to repeated questions about physicians or treatments may require a more direct approach. In these cases, it may be necessary to tell the person that their advice won’t be acted upon because it’s not the right decision. It’s usually not necessary to be rude or to burn a bridge with a friend or relative, but it may be necessary to make it clear that personal health decisions are no longer a welcome topic of conversation. Misperceptions about Crohn’s disease and ulcerative colitis are long-lived and pervasive in our society. A discussion about IBD provides opportunities for education but that’s not always possible or even something everyone wants to undertake. That’s why it’s a good idea to set expectations when it comes to advice about managing IBD. The unwanted advice can come from many different sources and while it is not always easy to deal with, if left unchecked or unchallenged it can become overwhelming. Some people may keep insisting on pushing their idea, and that may mean reestablishing your boundaries until they are heard and understood.